NABARD Assistant Manager Recruitment 2018-2019 Notification for 92 Grade A Vacancies is creating all the positive vibes in the contenders searching for the Central Government Jobs in India. National Bank for Agriculture and Rural Development is one of the reputed banks in India that helps Farmers. Therefore, those people who are aiming for the Bank Jobs can utilize chance. Now, the Requirements that are mentioned in the advertisement are pretty simple. All the thing now the candidates should do is check this article completely or refer the NABARD Assistant Manager Recruitment 2018-2019 Notification which we have attached at the end of this post. Please consider that all the contenders need to have all the Qualifications while applying. If not the contenders will have to disappoint, Because, the officials of the NABARD are going to reject them even though the contenders submit it before the final date. Check further. NABARD Assistant Manager Recruitment 2018-2019 Notification is surely a good news for the people who are looking for the Government Jobs. As per the data in the Notification, all the applicants need to submit the application form by the closing date. Basing on the information in the advertisement, all the people should submit the application form in the prescribed manner by the deadline. 2nd April 2018 is the closing date to submit the application form. Therefore, all the interested job hunters should hurry up and find out the Requirements. Do not worry if you are unable to get the information. Because on this page we are updating all the information that is mentioned in the advertisement. Therefore, basically, by checking this article, the contenders will get the idea about Educational Qualification, Name of the Vacant position, Number of Vacancies, Age limit, Application Fee, Salary, Recruitment Rounds. Please kindly check the above table. 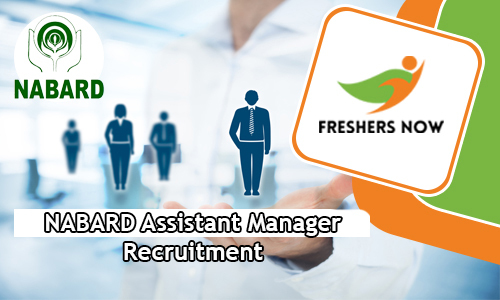 It contains all the important data related to the NABARD Assistant Manager Recruitment 2018-2019 Notification. We have tried to give as much information as we can in that table. By checking the table, you will know about the basic details about this Recruitment. Therefore, you will understand more easily, if follow this table. Now, according to the information in the NABARD Assistant Manager Recruitment 2018-2019 Notification, the officials of NABARD are looking for the contenders with some specifications. And they have mentioned the details in the advertisement itself. So, all the applicants need to check them. And then apply accordingly if they are having all those specifications correctly. Find out all the basic and mandatory information by going through the next sections of this post. First of all the people who are willing to apply for the NABARD Assistant Manager Recruitment 2018-2019, should know about the educational Qualification. If we check the advertisement clearly, it given that the applicants need to have the exact specification. If not such applications are rejected. Basing on the source in the notification, the officials of the NABARD are expecting the applications from the candidates who had finished either Graduation or Post Graduation from any recognized institute or University in India as the Educational Qualification. If you want to find out about the Work Experience, you can get them by referring the NABARD Assistant Manager Recruitment 2018-2019 Notification. Along with other details, in the next sections of this post, the job hunters can find some steps. And these steps will guide the contenders, to apply for NABARD Assistant Manager Recruitment 2018-2019. So, check them and proceed to apply. Now, coming back to the requirements, along with the education next important eligibility, all the people should be aware of is the Correct age limit. According to the data in the notification, the officials are ok with the age that is according to the norms of the organization. Therefore, to clarify your doubts about the Age limit and Age relaxation, either check the NABARD Assistant Manager Recruitment 2018-2019 Notification which we attached at the end of this post. Or check the official portal of the organization. Also, please remember that the information given on this page is only to refer. This was actually released by the National Bank for Agriculture and Rural Development on their official site. So, check them if you are having any other thoughts. Now, coming to the selection rounds, the officials have mentioned that they are going to conduct some Recruitment Rounds to choose the best people, from all the applicants. Remember that you all need to prepare well if you want to get placed in the organization. Remember that only your merit and performance is considered when hiring. And the final decision on hiring an individual will be totally in the Organization. And that is final. Keep this in Mind. In the official NABARD Assistant Manager Recruitment 2018-2019 Notification, the officials of the NABARD has not mentioned anything about the Selection Rounds. But please prepare in advance if in case the officials conduct any sudden rounds, to test the efficiency of the people. Now, those contenders who will get the job in the organization will also get the monthly salary. As per the data in the NABARD Assistant Manager Recruitment 2018-2019 Notification, the officials of the organization are going to pay good Salary. The Salary for the selected people will be as per the terms of the organization. But we can assure that pay scale will be best in the industry. Go to the official portal of National Bank for Agriculture and Rural Development at nabard.org. There check for NABARD Assistant Manager Recruitment 2018-2019 Notification. Freshersnow.com is a place where you can find such NABARD Assistant Manager Recruitment 2018-2019 Notification. So, for more such info, come back to our site.